The aim of this assignment is to critically evaluate the biopsychosocial perspectives and influences on the health and well being of a patient, a 38 year old gentleman who is dependent on alcohol. The aim of this assignment is to critically evaluate the biopsychosocial perspectives and influences on the health and well being of a patient, a 38 year old gentleman who is dependent on alcohol. This is in order to gain an insight into the pathophysiological effects of alcohol and the psychology and social influences on his drinking. To comply with the NMC The Code (2008) on confidentiality I have called my patient Jack. The World Health Organisation (WHO) (1948) defines health as 'a state of complete physical, mental and social well-being and not merely the absence of disease', (World Health Organisation, WHO, 1946, pg 100). This definition which was believed to be forward for its time is recognised as being an achievement with the 'absence of disease' (Taylor 2006), however the definition has also been criticised for being unrealistic as Godlee (2011) states, this definition explains health to be flawless, which would be impossible to achieve for the majority of the population, making us all unhealthy with Huber (2011) agreeing stating that giving the rise of chronic diseases the word 'complete' would leave most people unhealthy'. Canguilhem (1991) believed the definition from the WHO was considered to be an idealistic goal rather than a realistic one as he states that health could not be defined as a state, but seen as a process of continuous adjustment to the changing demands of living and of the changing meanings we give to life. This definition appears to be more holistic and realistic towards an individual's lifestyle taking into account their psychological and social aspects of life. The Department of Health, (DoH, 2007, pg 41) defined health as "a subjective state of being healthy, happy, contended, comfortable and satisfied with one's quality of life." These definitions are more holistic to an individual and appear to support the biopsychosocial model, whereas The WHO, (1946), definition appears to use the biomedical model as a framework as it defined health as the 'absence of disease' which has a less holistic approach but this could be because the biopsychosocial model had not been developed until 1977. ...read more. Jack started drinking at the age of 15 when his mother died in a car crash, his relationship with his father broke down as soon as he started drinking and was often referred to as a failure. NICE 2011 guidelines on alcohol dependence and alcohol abuse state that adverse life events can trigger excessive drinking and may predispose to the development of alcohol dependence, this is particularly apparent following a bereavement or job loss. Thompson et al (2008) suggested that there are two distinct types of alcoholism. Type 1 alcoholism affects both men and women and requires the presence of a genetic as well as an environmental predisposition and can start later on in life and can take on either a mild or severe form. Type II alcoholism, affects mainly sons of male alcoholics, is influenced only weakly by environmental factors, often begins during adolescence or early adulthood, is characterized by moderate severity, and usually is associated with criminal behaviour and that additional studies have demonstrated that type I and type II alcoholics also differ in characteristic personality traits (e.g., harm avoidance and novelty seeking respectively. Jack's drinking would correspond with Type 1 alcoholism as he mainly drank as a coping mechanism, although started at an early age but am unsure of any genetic connection with alcoholism and would not like to assume otherwise. Khantzian (1997) states that individuals become addicted as the result of their attempts to adapt their heightened reactions to stress and alleviate their feelings, while attempting to block out negative emotions or use avoidance as their sole coping strategies. Folkman and Lazarus have defined coping as 'the person's cognitive and behavioural efforts to manage the internal and external demands of the person-environment transaction that is appraised as taxing or exceeding the resources of the person' (Folkman et al., 1986), this could mean that the stressfulness of a situation is dependent on the person and how they cope with the environment and resources around them. ...read more. British Journal of Psychiatry; 191, p375-377 SMITH, C., 2002. The biopsychosocial revolution: Interviewing and provider-patient relationships becoming key issues for primary care. Journal of General Internal Medicine, 17, p309-310. STRECHER, V.J. and ROSENSTOCK, I.M. 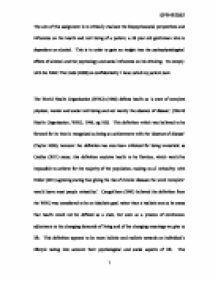 1997 The Health Belief Model: In Health Behaviour and Health Education: Theory, Research, and Practice 2: pp. 41-59. SNOOKS, M., 2009. Health Psychology: biological, psychological and sociocultural perspectives. London: Jones and Bartlett publishers SWAINE, J., 2009 'Deaths from alcohol abuse more than double in 16 years, ONS figures show', The Telegraph, 17 January 2009. Available from: www.telegraph.co.uk/health/healthnews/4359775 Accessed 19th February 2012 THE BRITISH PSYCHOLOGICAL SOCIETY & THE ROYAL COLLEGE OF PSYCHIATRIST, 2011. Alcohol Use Disorders: the NICE guideline on assessment and management of harmful drinking and alcohol dependence. London; Stanley L Hunt Printers Available from: http://www.rcpsych.ac.uk/files/samplechapter/NICEalchoholSC.pdf Accessed 11 April 2012 WADE, T. and HAILIGAN, W., 2004. Do biomedical models of illness make for good health care systems? British Medical Journal; 329, 1398-1401 WALDRAM, J.B., HERRING, A, and YOUNG, K., 2005. Dealing with alcohol, historical, cultural and epidemiology perspectives. Cambridge, Cambridge university press WALKER, J.G, JACKSON, H.J. and LITTLEJOHN, G.O., 2004. Models of Adjustment to Chronic Illness: Using example of Rheumatoid Arthritis. Clinical Psychology Review, 24(4): p461-488. WALKER, J., PAYNE, S., SMITH, P., and JARRETT, N., 2007. Psychology for Nurses and the caring profession, 3rd edition. Berkshire: McGraw Hill Education WESTON, W., 2005. Patient-centered medicine: A guide to the biopsychosocial model. Families, Systems, & Health Vol. 23(4); p387-405 WHITE, A., 2003. What happened; Alcohol, memory blackouts, and the brain; Alcohol research and health, 27:(2), p186-196 WHITE, Y. and GREYNER, S., 1999. The biopsychosocial impact of end- stage renal disease: the experience of dialysis patients and their partners. Journal of Advanced Nursing. 30(6); p1312-1320 WORLD HEALTH ORGANIZATION., 1946. The constitution of the World Health Organization. Geneva: World Health Organization. WORLD HEALTH ORGANISATION., 2004. Global Status Report on Alcohol. 2nd edition. Geneva: World Health Organisation WORLD HEALTH ORGANISATION., 1994. International Classification of Diseases. 4th edition. Geneva: World Health Organization. WORLD HEALTH ORGANISATION., 2005. Preventing chronic diseases: a vital investment: Geneva: World Health Organisation ?? ?? ?? ?? 09BNB2062 1 ...read more. The district is also 6.12% above the national average. The biggest mortality rates for the area are Cancers, CVA and Coronary heart disease (CHD) (NEPHO 2008, STPCT 2006/07). The north east over the last 25 years has always had a higher than average mortality rate, dating back to the 1981 census (Philimore et al 1994). Weekly MDT meetings were held, which allowed the team as a whole to discuss plans of care. At this point social workers are updated relating to their area of care and look into the possibility of services post discharge. Jane was kept updated of this information which can only be implemented on her consent. facilitating feelings of loneliness and isolation (Harth et al 1990). With cross reference to the literature, these findings do not appear to be groundbreaking, these problems have been highlighted during the last two decades, yet the problems still remain and institutions do not appear to be moving towards a new paradigm (O'Brien et al 2009). Research has shown that the most significant risks from poor housing are associated with damp, which can contribute to diseases of the lungs and other parts of the respiratory system. Cramped living in poor conditions leads to accidents, sleeplessness, stress and the spread of infection. Hand over was a good source of information used in order to find whether the care being given is right for the patient. The ward used pre written handover sheets which were kept updated by the ward clerk, this allowed more time to write important details in a short space of time. The fluctuation in the distribution of mortality over the years suggests that social (including industrial and occupational) as much as "natural" factors must be at work in creating the pattern of regional health inequalities. One of the most important dimensions of inequality in contemporary Britain is race. This would of course be discussed with the client before hand and they would be the ones to decide what distance is comfortable for them. Once they are comfortable imagining the subject at a certain distance, it could then be brought a little closer and each time the client would be encouraged by the therapist to feel calm and relaxed.